About a year ago, Nancy Branka, my editor at Executive Travel magazine assigned me to interview Bjorn Kjos, the affable boss of the upstart airline, Norwegian. Give the gal credit, she knew long before the rest of us, that Kjos was the kind of airline executive who makes his dreams come true. In the past few weeks, the Oslo-based low-cost carrier has made several big announcements. New service will begin (and in some cases already has) between Oslo, Copenhagen and Stockholm and Los Angeles, Stockholm and Oslo to Oakland and Oslo to Orlando giving the airline four-points-on-the-U.S. map to Scandinavia. It started flying from Oslo to New York in May and from Copenhagen to New York on Tuesday. "Non-stoppable service" the press release says. Whether the oblique reference to the airline's brush with disaster-by-Dreamliner was Norwegian's idea or came from the press reps for Orlando International Airport, I can't tell. 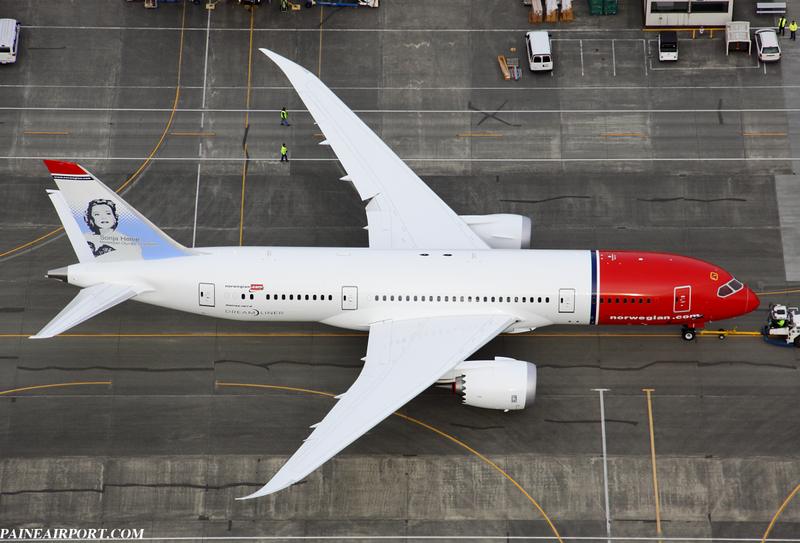 The grounding of the airliner delayed delivery of Norwegian's first Boeing 787. It was pretty upsetting at the time but making light of it now seems typical of Kjos's roll-with-the-punches persona. Well, he's got reason to be jovial. All the drama and cost associated with having to lease a larger and less fuel efficient Airbus A330 (read my article on this in The New York Times here) to fly the New York route, doesn't seem to have held the airline back. Norwegian boasted it carried more than two million passengers in July with a load factor of 86 percent, an increase in passenger volume of 17 percent over July 2012. I had a lot of fun tailing Kjos on a trip from Oslo to Copenhagen where the fighter pilot, turned lawyer, turned novelist turned telecommunications executive turned airline boss toured a UNICEF distribution center and showed me there are some things he can't do well. Joining the charity's employees packing boxes with educational materials, Kjos made a bit of a mess and slowed down progress. Leaving the warehouse work to the professionals, Kjos told me on the flight back to Oslo that he intends to turn Norwegian into a global, low-cost, long haul carrier. "You will compete with everybody globally. Your largest competitor in the future that will be the Chinese and the Far East airlines. You’ have just got to face it, deal with it," he said. "That means you can have your headquarters in Scandanivia" but you have to have local people. His decision to outsource jobs including cabin crew and pilots to countries like Thailand and Spain, where labor costs are lower has been controversial. His apparent and early success must be tempering the fallout though, as he's widely admired in Norway. Whether the airline lives up to the PR billing "Non stoppable" remains to be seen, but the good news does seem to keep on arriving for Norwegian, as if on schedule. You neglected to mention how Norwegian's grown has impacted things at SAS. Founded in 1946, SAS is one of Europe's "classic" legacy carriers, with quite a rich history. It'd be terrible to see them go the way of Swissair or Sabena. Norwegian's outsourcing of crews to Spain and Thailand has to be unpopular. Is it just a matter of time before air crews go the way of crews on commercial ships? PS, right now, SAS has got to be feeling the pinch. Based in Oslo, with an Irish operating certificate, and an HR office in Bangkok. Is anyone else excited that this guy is turning our Open Skies treaties against us? So will the crew base be in Fort Lauderdale or Kennedy? it seems that the only thing that is "Norwegian" about the entire business is the CEO.